While the herbs from your garden are best when used freshly picked, there are always more than you can use in one season. Dried herbs offer the next best thing to fresh. Air drying herbs is not only the easiest and least expensive way to dry fresh herbs but this slow drying process can also help retain the essential oils of the herbs, so they don't lose all their flavor. Air drying works best with herbs that do not have a high moisture content, like Bay, Dill, Marjoram, Oregano, Rosemary, Summer Savory, and Thyme. To retain the best flavor of these herbs, you will either need to allow them to dry naturally or use a food dehydrator. A microwave or an oven set on low may seem like a convenient shortcut, but they actually cook the herbs to a degree, diminishing the oil content and flavor. Use them only as a last resort. If you want to preserve herbs with succulent leaves or a high moisture content, such as basil, chives, mint, and tarragon you can try drying them with a dehydrator, but for the best flavor retention, consider freezing them. It's easy to do and even quicker than drying. For the fullest flavor, harvest herbs before they flower. If you've been harvesting branches all season, your plants probably never get a chance to flower. However, by late summer, even herbs that have not flowered will start to decline as the weather cools. This is a good time to begin harvesting and drying your herbs. Cut branches in mid-morning. Let the morning dew dry from the leaves, but pick before the plants are wilting in the afternoon sun. Do not cut the entire plant, unless you plan on replacing it. You should never cut back by more than two-thirds or remove more than about one-third of a plant's branches at one time. Cut healthy branches from your herb plants. Remove any dry or diseased leaves. Yellowed leaves and leaves spotted by a disease are not worth drying. Their flavor has already been diminished by the stress of the season. Shake the branches gently to remove any insects. There are always hitchhikers and since you won't be thoroughly washing the stems, you want to get rid of as many as you can now. If you've picked your herbs while the plants are dry, you should be able to simply shake off any excess soil. Rinse with cool water only if necessary and pat dry with paper towels. Hang or lay them out where they will get plenty of air circulation, so they can dry out quickly. Wet herbs will mold and rot. Remove the lower leaves along the bottom inch or so of the stem. You can use these leaves fresh or dry them separately. Bundle 4 - 6 stems together and tie as a bunch. You can either use a string or a rubber band. The bundles will shrink as they dry and the rubber band will loosen, so check periodically that the bundle is not slipping. Make small bundles if you are trying to dry herbs with high water content, so they get air flow between the branches and do not rot. Punch or cut several holes in a paper bag. Label the bag with the name of the herb you are drying. Place the herb bundle upside down into the bag. You can include the loose leaves you removed from the bottom inch of the stems if you like. Gather the ends of the bag around the bundle and tie closed. Make sure the herbs are not crowded inside the bag. Hang the bag upside down in a warm, airy room. Check in about two weeks to see how things are progressing. Keep checking weekly until your herbs are dry enough to crumble and ready to store. Store your dried herbs in airtight containers. Small canning jars work nicely. Zippered plastic bags will do as well. Be sure to label and date your containers. Your herbs will retain more flavor if you store the leaves whole and crush them when you are ready to use them. 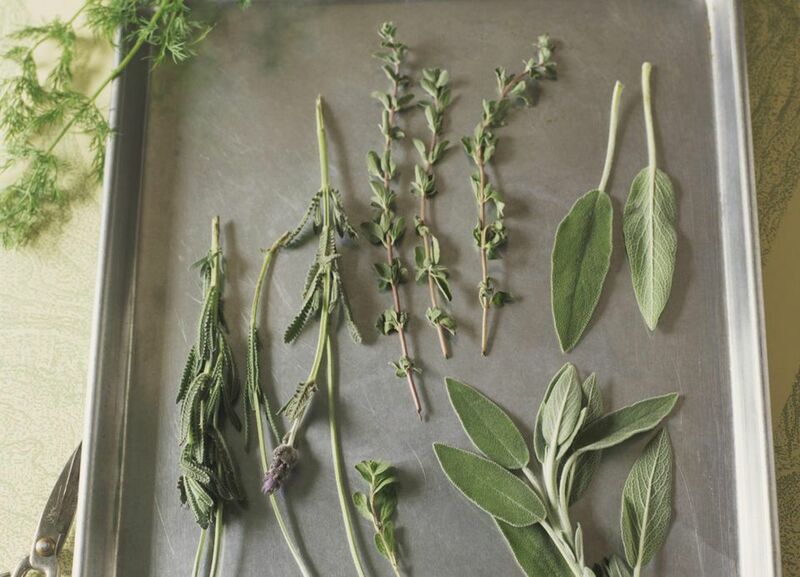 Discard any dried herbs that show the slightest sign of mold. It will only spread. Place containers in a cool, dry place away from direct sunlight. There are now amber colored canning jars that block sunlight. When you want to use your herbs in cooking, simply pull out a stem and crumble the leaves into your pot. You should be able to loosen the leaves by running your hand down the stem. Dried herbs are best used within a year. As your herbs lose their color, they are also losing their flavor. Use about 1 teaspoon crumbled dried leaves in place of a tablespoon of fresh herbs. What Is the Right Way to Freeze Fresh Herbs? How Do You Select and Store Garlic? Cilantro or Coriander...What's the Difference?